It's not that punters are locked out of these gatherings, but, away from the public gaze, the airline industry's bean-counters occasionally hold networking talkfests whose contents would either amaze or enrage the average traveller. Such a nosh-up took place last week in San Franciso: the Amadeus Horizons 2010 conference, hosted by one of the airline industry's biggest IT providers (Amadeus), which supplies one of the leading computer reservations systems. One of the headline acts was the unveiling of this year's study by Amadeus and US consulting firm IdeaWorks, "Ancillary Revenue by IdeaWorks 2010", which predicts that the global airline industry will this year generate just on $US26 billion in so-called ancillary revenue. That's money for stuff that used to be provided free as part of the service. 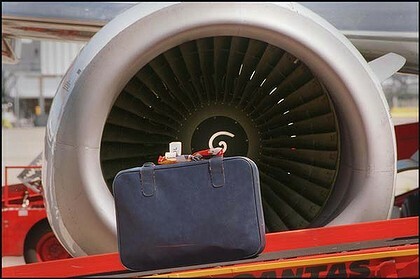 Flightglobal.com reports IdeaWorks president Jay Sorensen says baggage fees, which drove an estimated 43 per cent increase in ancillary revenues in 2009, continue to be the primary driver of increased ancillary revenues in 2010. He says passenger convenience fees, which include priority boarding and pre-assigned seats, are also on the rise. "What is amazing about this area (passenger convenience fees) is it's very profitable," Sorensen said. "The cost of a seat assignment or boarding early is almost none." If you're an airline accountant, you're wetting yourself with excitement. But, for the rest of us the message is very different: ancillary fees are a price-gouging ripoff. They are being used even by airlines charging relatively expensive rates to increase their total take. Excess baggage fees started out being a justifiable attempt by the industry to recover the actual cost of carrying baggage, but the extortionate rates now being charged by some airlines would make a freight manager blush. What an airline balance sheet can't explain is that ancillary charges are destroying trust between airlines and their customers, many of whom are now fearful of what their next trip will end up costing. Even though consumer regulators, including Australia's, have begun moving to outlaw "asterisk" pricing, the airlines are gleefully adding as many asterisks as they can get away with. Ancillary revenue has become the new boasting club of the airline industry, at the same time airlines attempt to maintain customer loyalty after seriously damaging it by emasculating frequent flyer programs that now provide only cheap travel to their members, having abolished the concept of "free" flight rewards. Meanwhile, back in in San Francisco, Jay Sorensen expects another "significant increase" in ancillary revenue next year. Sorensen says bag fees were the biggest single driver in the increase last year as "baggage lit up all the US carriers", flightglobal.com reports. Sorensen says baggage fees are here to stay and sees them spreading more to international routes. "We feel the era of no fee for the first checked bag will gradually disappear," he says. He also predicts that "free meals in coach (economy) will gradually disappear" including on international flights, although he says there will be some exceptions to the rule and it will take time for this to become a universal trend globally.